On May 7, 2016, King Salman bin Abdulaziz al Saud announced the most comprehensive change in Saudi ministries in decades and a revamped 9 GW by 2023 clean energy target laid out by deputy crown prince Mohammed bin Salman, in the “Saudi Arabia Vision 2030” policy paper. After the Kingdom’s complete non-execution on its previously announced 54 GW goal, some in the renewable world might be inclined to take this new announcement with a grain of salt. But according to Oxford University’s Middle East Energy Expert Justin Dargin – who had been very skeptical at the time of the earlier announcement – new realities make this time completely different. Dargin told CleanTechnica that he believes that the “more rational” new target can and will be met. Saudi Arabia’s previous 2011 announcement, to the excitement of the renewable world, would have seen 54 GW of renewable energy by 2032 supply a third of the Kingdom’s electricity. But only 25 MW of that goal was deployed in the six years since the announcement in 2011. Dargin proved to be correct. So what has changed, and why is this time likely to succeed? “The ruling family has made a change in the governing structure to eliminate infighting amongst multiple ministries that had prevented action. Ministers who were dragging their feet on implementing the renewable energy goal have been ousted,” he said. One of the key problems in Saudi Arabia has long been an extremely conservative culture of obeisance to the Royal Families who decide the direction of a Kingdom which still doesn’t allow movie cinemas or allow women to drive. There is real concern with losing face and reputation, so that everyone is afraid of bearing any bad news. With its rulers so shielded from reality and short of direct honest feedback, the Kingdom had tended to have limited ability to develop and innovate. As this applies even more to any new technology like solar, this psychology could have greatly limited the Kingdom’s ability to switch from an oil-based economy to solar. So there were good reasons to be skeptical. Saudi Arabia was in no way a country known for any renewable energy development expertise. It barely registered in the renewable world. But that is changing. Dargin had said previously that for change to happen, it has to be initiated from the top. With the new embrace of renewables coming directly from the son of King Salman, deputy crown prince Mohammed bin Salman, change is possible. Bin Salman’s new “more rational” goal has a lower bar, but it must be met much sooner, and lays out a method for getting there, using a series of competitive auctions. And it is still a sweeping change. If projects from the first round of bids are completed by 2018, it would take an average deployment of 1,600 MW of new capacity each year for 6 years. Dargin pointed out that 9 GW is just the initial step of a multi-decade switch. But changes are making the time right for a clean energy switch now. 1.There is now a precedent for effective solar policy in the Arabian Gulf. The first Gulf country to use competitive auctions, the UAE’s Dubai, has been breaking solar price records with bids to build each 200 MW phase of the Sheikh Mohammed bin Rashid Al Maktoum Solar Park. Last year, ACWA Power bid under 6 cents unsubsidized. This year, Masdar bid under 3 cents. These are not only the lowest solar prices in the world, but on a par with prices for gas-fired power in the UAE, and lower than the prices for coal. The low prices are partly the result of competitive auctions. Saudi Arabia could follow Dubai’s example of auctions rather than the initially high feed-in tariffs that eventually wound up destabilizing the solar industry in Germany and Spain, as subsequent governments yanked them out. “If the Kingdom follows the path of Dubai in a competitive bidding process, with a flexible framework, then it is likely to reach these low solar energy prices as well,” Dargin said. 2. Saudi firms are now among leading regional developers. Already, firms based in Saudi Arabia have been among the winning consortia to bid in both phases of the Dubai project for DEWA, Dubai’s Energy and Water Authority. This year, it is a Saudi firm, Abdul Latif Jameel (ALJ), in a consortium with French solar developer Fotowatio Renewable Ventures (FRV) and Masdar, that offered the lowest bids for Phase III at Dubai – breaking global solar records with the world’s-lowest-ever 2.99 cents. 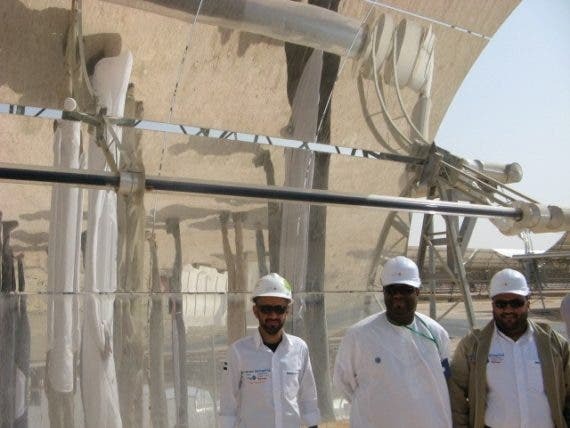 Last year, it was another Saudi-based firm, ACWA Power, that broke world records in Dubai for Phase II of the Sheikh Mohammed bin Rashid Al Maktoum Solar Park, with 2015’s lowest unsubsidized price for PV at 5.85 cents per kWh. “ACWA Power have built up a solid business model and that allows them to access capital at attractive rates,” Steven Geiger, a former founding director of Masdar, told CleanTechnica. “They are very aggressive and very driven, and they realize they want to own this game and Paddy [Padmanathan] is a very impressive leader,” said Geiger, who is now a partner at the US investment firm Innova Partners. 3. Solar in the Gulf is getting the same favorable finance rates as oil. According to both Geiger and Dargin, these kinds of prices are possible in part because finance rates for the solar industry in Saudi Arabia are closing on parity with oil industry finance rates. The ruling families in the region have now begun to provide the same kinds of rates to finance solar and wind projects as they already offer the oil and gas industry. Some may see financial support of energy infrastructure by Middle East ruling monarchies as a little creepy, but even in democracies, government support has helped build new energy industries. Coal in the 1700s through the 21st century, oil from the 19th-21st century, and nuclear in the mid-twentieth century. all had government help. Government help makes sense economically, even more so now that we are dealing with energy sources like wind and solar with no ongoing fuel cost. When a government supports capital-intensive, but fuel-free, energy at low interest rates this results in cheaper electricity over the long term. For example, the US Treasury lent the money to build the government-owned Hoover Dam in 1935, at 3% interest to the Bureau of Reclamation, the owner. It took 50 years to pay back, at a very low few cents on electric bills, spread among 20 million utility customers. This initially high capital cost project has provided the cheapest electricity in many utility districts across the Southwest US for the last 50 years. 4. Finally, it is clear that the end of oil is nigh. Saudi Arabia is in deep trouble financially, as a result of its complete dependence on oil prices. It is a race to the bottom for the global oil industry. This week, OPEC failed to reach an agreement in Vienna not to flood the market with oil. As hedges against below-cost oil prices are now beginning to time out, banks are pulling out. By mid-2015, it has been a race to get the last dollars out fast, and to recoup at least existing exploration and development investments. Rock-bottom pricing would mean the Kingdom held on to market share as prices crashed, even though with the true production cost to produce a barrel of oil at near $50, they are merely liquidating inventory. Even the Financial Times, which is very focused on the fossil industry, points out in The long twilight of the big oil companies, that fossil fuel producers face a future of slow and steady decline. When Saudi announced its initial goal in 2011, its grid had a 50 GW demand. That has been rising 8% a year, and continues to do so. Saudi Arabia is completely dependent on oil from its oilfields to burn for electricity, about half derived from flared gas and the remainder from diesel, crude oil, and heavy fuel oil. The writing is now clearly on the wall, in a way it wasn’t back in 2011 when the Kingdom floated its first ambitious but distant solar goals.